Throughout his life—as a student, corporate executive and after leaving the corporate world—David traveled extensively throughout Europe and the Middle East. The many museums and galleries he visited abroad helped to shape his artistic vision. It was at museums like the Pompidou in Paris that he acquired a love of Abstract Expressionism. Although David continues to study representational art, he considers his abstract work to be his most serious. Experimenting freely with colors and textures, he uses a variety of techniques to apply paint. He enjoys working with a wide range of colors, including fluorescent, iridescent and duochrome. 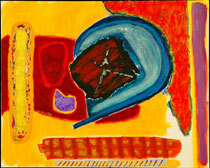 These ultra-modern colors lend an unusual contrast to his paintings that use primitive motifs. David believes that art is a way for us to find the childhood wanderer in ourselves, and in order to create we must often feel lost as we follow that wanderer blindly. "I have been told that my paintings have a childlike quality about them, and I think I understand why. As a boy I loved to get lost. I ran off several times and search parties had to be sent out after me. Painting offers another way for me to get lost. I enjoy it most when I have no idea what I am going to do next. Then art is truly a joy. I allow the wanderer in me—the boy who loved to get lost—the freedom to turn any which way he likes at any particular moment. When I follow this wanderer I experience a wonderful thoughtlessness. Fortunately or unfortunately, I always find my way back when I finish a painting. Then it is fascinating to see where I’ve been, and I am surprised that these works of art are not simply the product of a heedless young wanderer. They also reflect the experiences of an older man who has gotten lost in the outside world—a man who has tried to create a window into this boy’s inner secret world. I understand that it is not a window through which everybody can look. But I am given another kind of joy when somebody can see into the world of my paintings. I feel as though they have joined me in a very special place, which is neither mine nor theirs, but belongs to anyone who is willing to get lost."